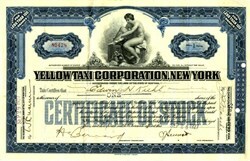 Beautifully engraved SCARCE uncancelled stock certificate from the Yellow Taxi Corporation, New York issued in 1927. This historic document was printed by the American Banknote Company and has an ornate border around it with a vignette of Mercury. This item has the signatures of the Company’s officers and is over 92 years old. Manhattan's two largest Yellow Cab operators, American Yellow Taxi Operators Inc. and the Yellow Taxi Corporation were merged on July 21, 1922 to from Yellow Taxi Corporation, New York. "The American Yellow Taxi Operators, Inc., is advertising the news that the New York Supreme Court has granted it an injunction restraining a rival operator from using the same or similar design and color scheme on its taxicabs in New York newspapers. "Steps are being taken to remove the other numerous imitators that are trading on good-will at your and our expense." Manhattan's two largest Yellow Cab operators, American Yellow Taxi Operators Inc. and the Yellow Taxi Corporation were merged on July 21, 1922. American Yellow Taxi Operators had been founded by Ernest H. Miller, a Yellow Cab operator from Newark, New Jersey. Born in Marion, Ohio, Miller started his business career as an office boy at the Marion Daily Star, a newspaper owned by Warren Harding, the 29th president of the United States. He entered the taxicab business in 1919 by organizing the Yellow Cab Company of Newark, N. J. serving as it president for the next decade. In 1921 Miller helped organize the American Yellow Taxi Operators Inc. a Manhattan operator which was subsequently merged into the Yellow Taxi Corporation, another Manhattan operator, in 1922. Fifteen months later (November 9, 1923), the Yellow Taxi Corporation was merged into a new firm, the Yellow Taxi Corporation, New York and three years later Miller was elected president. In April, 1929, control of the company was acquired by Parmelee Transportation Corporation. The company was acquired by Morris Markin of the Checker Motors Corporation in the 1930s and remained under Checker control until the mid-1960s.